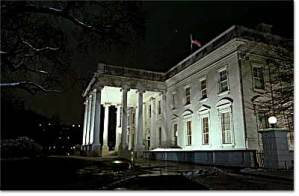 Even though the White House is an American institution at the center of our political climate, it is also a hot spot for ghosts. Several former presidents are said to frequent many of the rooms in the house. President Harrison has been seen and heard rummaging around in the White House attic, who knows for what. Andrew Jackson frequently joins guests in what was his bedroom during his presidency, and Abigail Adams has been spotted roaming hallways apparently carrying something. The most spotted president ghost, however, is Abraham Lincoln. Eleanor Roosevelt was said to have felt the presence of Honest Abe while she worked in the Lincoln bedroom. Also, during the Roosevelt administration, a young clerk saw Lincoln's ghost sitting on a bed removing his boots. Queen Wilhelmina of the Netherlands, during an overnight stay, was awakened by a knock at her door and, upon answering, saw the ghost of President Lincoln facing her in the hallway. Calvin Coolidge's wife reported on several occasions seeing President Lincoln standing at a window in the oval office with his hands clasped behind his back, appearing to be in a deep contemplative mood. Check out the official White House webpage for more about its many ghosts.